Robolinux 10.1 Cinnamon DVD (64-Bit) | Linux DVD Shop - UK Linux Shop supplying Linux on CD, DVD and USB with Free UK Delivery, 24Hr Dispatch. RoboLinux is a simple, user-friendly Linux OS perfect for new users or users migrating from Windows OS. Based on the latest stable release of Debian GNU/Linux it also brings a built-in virtual machine package capable of running Windows XP and Windows 7 on your Linux desktop. 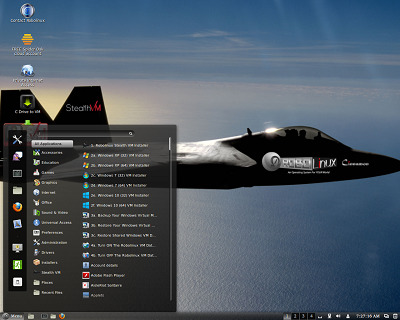 RoboLinux uses the Cinnamon desktop, becoming so popular now as pioneered by Linux Mint. RoboLinux brings a quick, snappy user experience and the look and familiarity of Windows OS and Mac OS X. With a simple Add/Remove package manager and many popular software pre-installed such as LibreOffice, Firefox, Chrome, Thunderbird and Skype. RoboLinux is ready to go in either a risk free "Live" environment where it runs from the DVD and memory or with a full install feature.